The majority of humans I have met are vastly humane. Comparatively, the majority of Government decisions are seen as exasperatingly profane. The Canadian Food Inspection Agency (CFIA) has been slowly going the way of the other federal departments in our post-democratic Canada; they have gone from having the occasional nosebleed of odd policy, to having chronic influenza of misguided rulings, to now having a dead soul. The majority of humans I have met are vastly humane. Comparatively, the majority of Government decisions are seen as exasperatingly profane. The Canadian Food Inspection Agency (CFIA) has been slowly going the way of the other federal departments in our post-democratic Canada; they have gone from having the occasional nosebleed of odd policy, to having chronic influenza of misguided rulings, to now having a dead soul. Now before I go off accusing them of being treasonous bad citizens and make no attempt to be polite with the language I use, I should admit that I've had a year-long relationship with the CFIA after they uncouthly targeted my goat Sunshine for death in one of their "eradication programs." These under-the-radar programs are essentially tax-payer funded life insurance programs that kill exponentially more healthy animals than could ever even be exposed to the diseases they try to control. I was subjected to bizarre threats and bullying from agents, and am still unable to determine if this is just bureaucratic foolishness or perhaps some clumsy hatred towards living beings themselves? If the latter, it's an embarrassing apology for them to essentially say, "we're sorry Canada, I guess we just don't like life as much as you." Recently, the CFIA made two curious rulings that when examined together warn of how meticulously they have run amok with Canada's food safety. First they approved a couple more drugged feeds for rapid weight gain in farmed animals. This may seem conventional enough to you, except that the active drug ractopamine has been banned in 160 countries as a suspected carcinogen and a fatal poison. It seems the CFIA has simply ignored research that clearly warns how dangerous this drug is to humans and how terrifyingly inhumane it is to the animals. At the same time the CFIA ruled to target a popular veggie sausage, forcing the vegan grain meat company Field Roast to halt Canadian distribution and ultimately defend the entire meat-alternative industry from being fundamentally illegal for allegedly resembling animal-meat products. The CFIA made these two rulings without much of a sense of humour for their coincidental timing, or maybe simply without much sense at all. It is dishonorable shabbiness in the bureaucratic extreme to find a sneaky backdoor way to get a popular, healthy, non-meat product off the shelves (after it was already well established in the marketplace) -- while at the same time opening the door for unwanted, dangerous, cheap-meat products to flood the supermarkets. They are horsing around with every Canadian's right to health. The bias is overt. Quality grain products are being squeezed while crude meat products are being embraced. Humans and pre-human ancestors have been eating the seeds of grass-like plants (ie: grains) for about 4 million years (unless you are paleo or a creationist, but even then we can still politely agree on humans cultivating, cooking, and finding creative ways for storing grains for tens of thousands of years. The CFIA's new interpretation of the law requires that a vegan grain food that resemble animal-meat products to now undertake tests preformed on live animals (which obviously defeats the purpose of it being vegan) and still would further require a special act of parliament to again be sold in Canada. The test involves animals who are force fed an isolated protein and weighed as they grow to measure protein intake. Besides being barbaric and not even accurate, this specific test requirement is also ironic when compared to the drugged weight-gain animal feed approved into the status quo at the same time. We are all becoming increasingly aware of the accumulative harms of consuming meat from animals raised in our contemporary farming operations. That awareness is still on the surface and not yet inclusive of the commonly used dangerous drugs like ractopamine. You may not have heard of ractopamine before but if you've eaten Canadian pork, beef or turkey, then you have likely consumed meat from an animal that's been fed this drug -- and eaten ractopamine yourself. 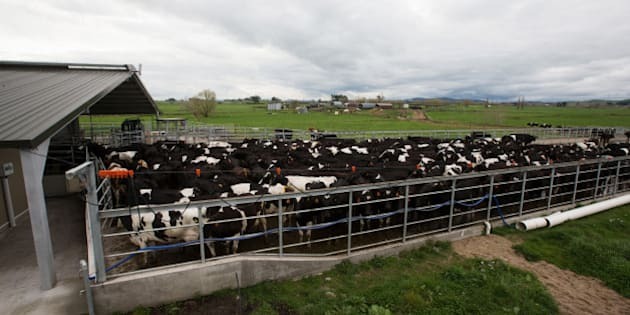 While other drugs require a clearance period of a couple weeks to help ensure much of it is flushed from the animal prior to slaughter, there is no clearance period for ractopamine. The drug is often still administered in the final days leading up to slaughter, and as much as 20 percent of it can remain in the meat you buy. Coinciding with the CFIA's initial approval of the drug in Canada, slaughterhouses have seen an increase in "downers" (animals too ill or fatigued to stand). I'll tell you more about ractopamine if you want -- but you'd be out of your head to ask. It makes pigs go out of their minds, causing hyperexcitability and heightened stress levels. It is said to be, "the cruelest thing to do to the pig's psyche -- or to any creature's state of mind and sense of well-being." The CFIA is sanctioning chemical torture simply for industry profit, and certainly not for public health. Ractopamine has been linked to the hooves of cattle rotting right off. Chromosomal abnormalities, behavioral changes, birth defects -- in case you are squeamish I can simply say that even China banned ractopamine and has seized U.S. meats that tested positive for it. How can the CFIA insist on now being extraordinarily picky about the human consumption of grain products when they don't seem to bother to even consider the research that taints the trust of meat products? We have a lame watchdog in our industrial agricultural midst. Comparing the CFIA's embrace of drugged meat with their targeting of veggie products confirms the CFIA is not only biased against meat alternatives, but also supportive of the many levels of the systematic abuse in the animal agriculture industry. In these vast catastrophes that have become our contemporary farms, animals suffer more than just a gloomy short life like on the farms of our grandparents. These are places of pure terror. Modern animal agriculture has wobbled our ability to be humane (and that was one of the best things about our humanity). Rather than find creative ways to cause suffering to the other beings stuck on this planet with us, we should be embracing the alternatives that are better for all. Should we expect our government departments to be slathered with decency and rolled in honesty? Do we really expect them to carry out their responsibilities with utmost kindness, wisdom and watchfulness? This is probably not realistic anymore, but in the very least we should demand that they not intentionally frustrate people's lust for a kinder world. The stereotype of Canadians being a politely apologetic bunch is coming true because we are being embarrassed profoundly by our government on the world stage. We could forgive the CFIA if it was purely stray bureaucratic momentum which caused these errors in judgement. But these are new stumbles, similar to their refusal to even dialogue about introducing GMO labeling in Canada (in fact, many call the CFIA the official lobby group for Monsanto and the biotech industry). All of this added up feeds the sentiment that CFIA is a sham, it is no more interested in either food or health than an outlet mall.